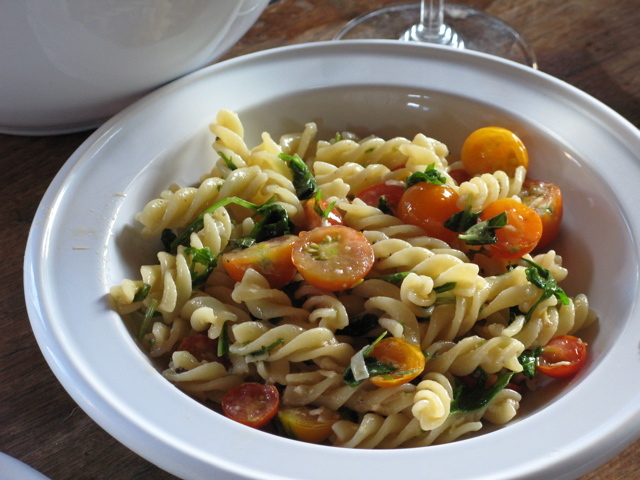 Salad of sun-ripened ‘Orange Blossom’ tomatoes and basil. The beautiful gunmetal-glaze plate is by artist Aletha Soule. There is nothing in this world quite like the flavor of a sun-ripened ‘Orange Blossom’ tomato picked fresh from the garden. For my lunch today I enjoyed a salad of home grown tomatoes and basil, seasoned with extra virgin olive oil, balsamic vinegar and fresh ground black pepper; one of my favorite simple pleasures. 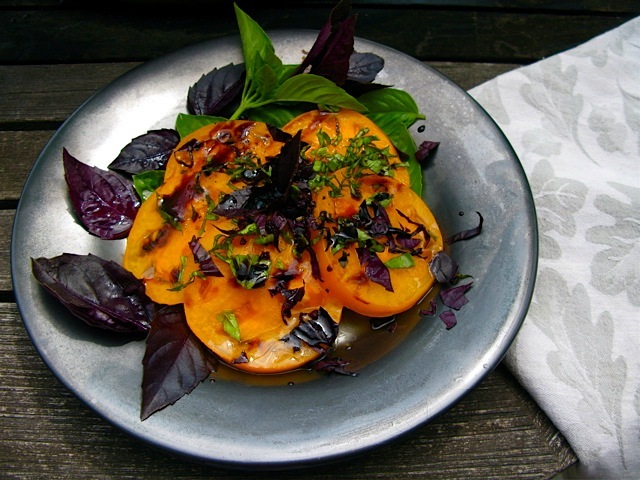 In honor of the first ‘Orange Blossoms’ harvest, I served my salad on one of artist Aletha Soule’s beautiful ceramic plates, decorated with purple and green basil leaves. Isn’t it amazing how such a simple thing can feel so special? This year, I almost think I should rename my favorite tomatoes ‘Gold Blossom’, for they certainly have been a hard-won treasure. It has been a tough summer for growing tomatoes in New England. Last year at this time, I had a bumper crop of tomatoes. I harvested four different heirloom varieties as well as ‘Early girl’ and ‘Lemon boy’s to beat the band. 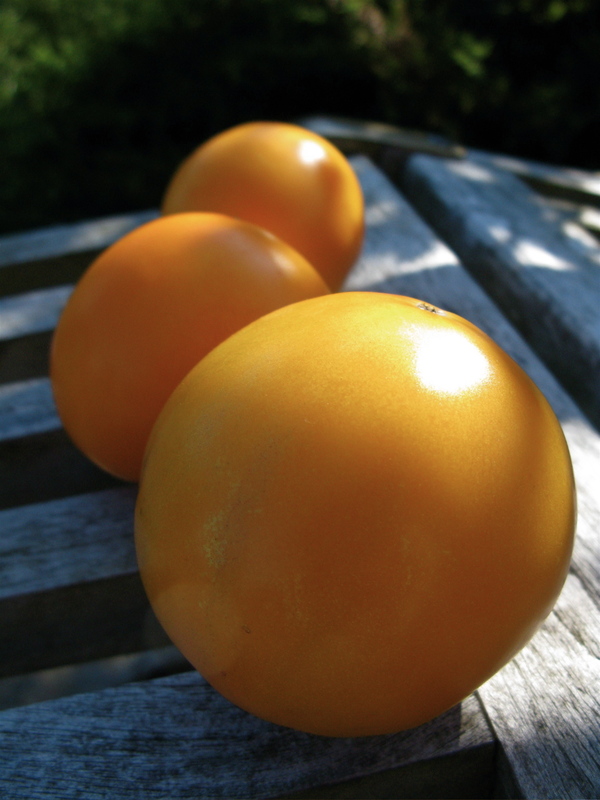 ‘Sungold cherry’ tomatoes were so abundant I was giving them away to anyone willing to take them off my hands. No such luck this year. My tomatoes went in early this summer, (protected by small hoop houses), and were off to a fantastic start. But a cold, rainy June and soggy July soon followed the removal of my protective hoops. The weather in the northeast hasn’t been good for warm weather crops like tomatoes, peppers and cucumbers. My vegetable plants were all slow to establish. Then just as the tomatoes began to blossom, and in spite of all my preventative measures, I noticed the tell-tale yellow spots of early blight on my tomato foliage. 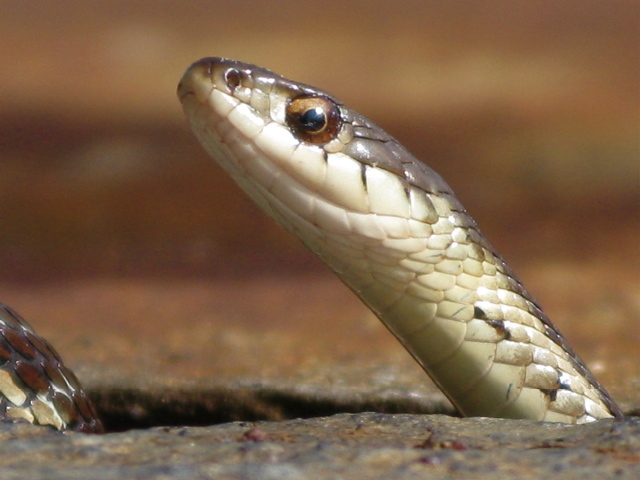 Fungus is a real problem in the garden this year, and though my tomatoes have so far been spared the dreaded late blight, I am carefully keeping watch. Cherry tomatoes have been appearing on my table for about a month now, but I only began harvesting ‘Orange Blossoms’ (pictured below), last week, (late for me), and so far my yield is significantly lower. Is it human nature to want what is less plentiful? 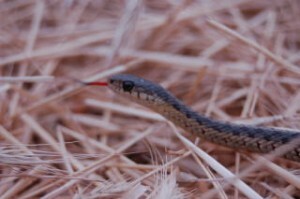 Maybe its just me, but this precious crop seems to taste even sweeter and more delicious this year. I garden organically, and of course the best way to deal with fungal infections like Alternaria solani, (the cause of early blight), is to prevent them before they start. I began applying copper fungicide early, (see photo below), and reapplied after every rain. However this year’s weather, (the constant wet with little sunshine), created ideal conditions for early blight. By the first week of July, I began to notice yellowish spots on the lower leaves of my tomato plants. 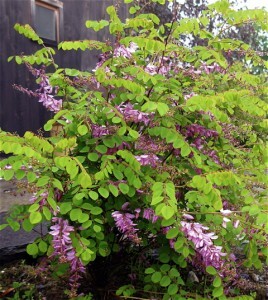 Immediately I pruned out the diseased foliage, and removed it from the garden. I will continue to snip off diseased leaves as spots appear throughout the remainder of the season. I am certain that my methods are helping to contain the spread of early blight and preserving the unripe fruit, even if my storm-battered plants are looking less-than-stellar this year. And though I may have fewer tomatoes, I can not really complain. Due to the cooler temperatures, this is the first year I have a steady supply of snow-peas in late July, as well as abundant arugula and lettuce. I will take the greens thank you, and try to be grateful for what nature provides. 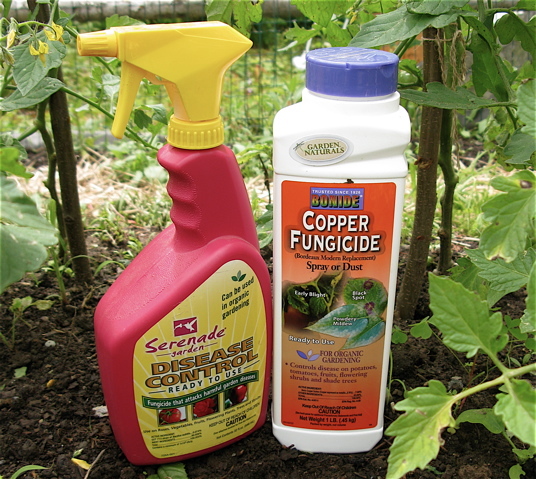 Serenade and Bonide fungicides for organic gardeners. For further information on identifying and controlling diseases and pests in the vegetable garden, see the Vegetable MD Online. This excellent resource is available to all of us courtesy of Cornell University. You will also find the Vegetable MD link on the sidebar to the right ,(beneath garden resources and vegetable gardening headers). Many thanks Cornell ! Call me a fiddle-head, it is true. I have a long standing love-affair with ferns. Ostrich and Cinnamon, Maidenhair and Lady, Autumn and Christmas; even their names delight me, and I can never seem to get enough of this delicate, feathery species. 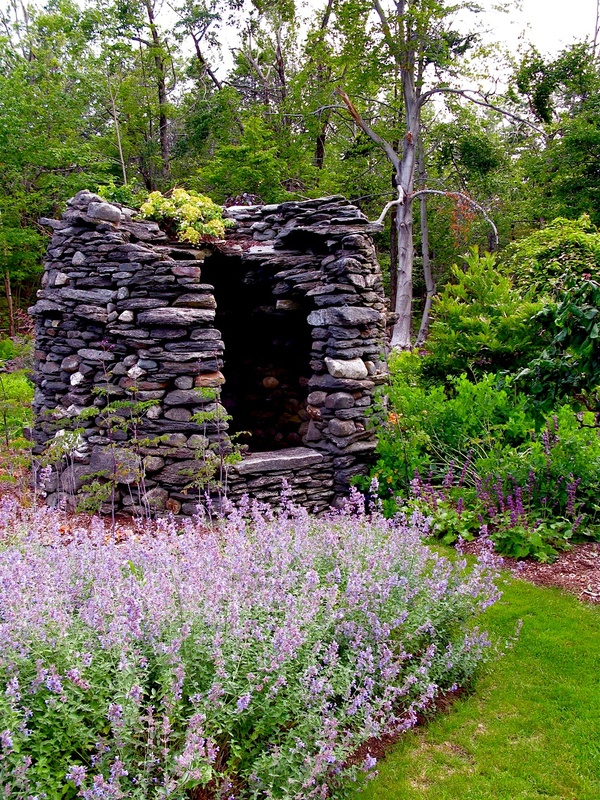 My affection can be traced back to the summers of my childhood; those long, hot afternoons and fading twilight hours spent exploring abandoned stone foundations and hidden brooks in the forest beyond my home. There, beneath the shade of tall trees, ferns became woven crowns and verdant skirts fit for imaginary forest royalty. To my eye, when it comes to beauty in the plant world, foliage truly equals flower. What could be more beautiful than the fern? Shimmering, silver fiddleheads unfurling from damp earth, luminous feather paths winding through dark tree-trunks, and lacy plumes softening rugged outcroppings of rock and ledge; ferns possess some of the most dramatic foliage in the forest. 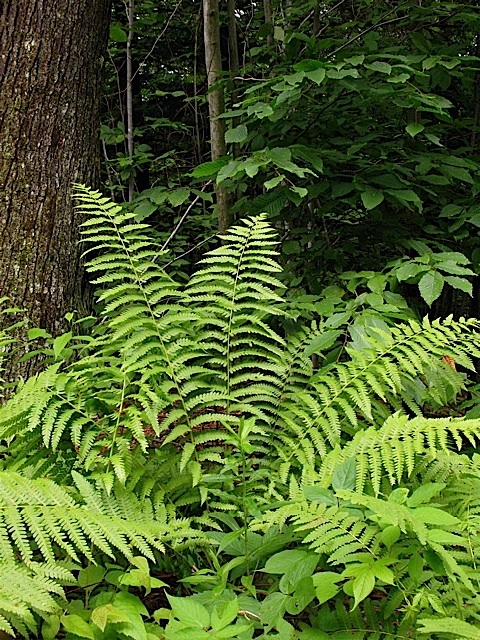 Native to North America, the cinnamon fern, (Osmunda cinnamonea, pictured below), is a perfect example of the long-lasting beauty of this foliage plant. In very early spring, the fuzzy, silvery-white tipped fiddle-heads of cinnamon fern emerge from the forest floor. As the first tightly wrapped heads unfurl, (reaching upward 2-4 feet), they quickly transform into stunningly beautiful, rich cinnamon stalks, followed by rapidly emerging, bright green fronds. 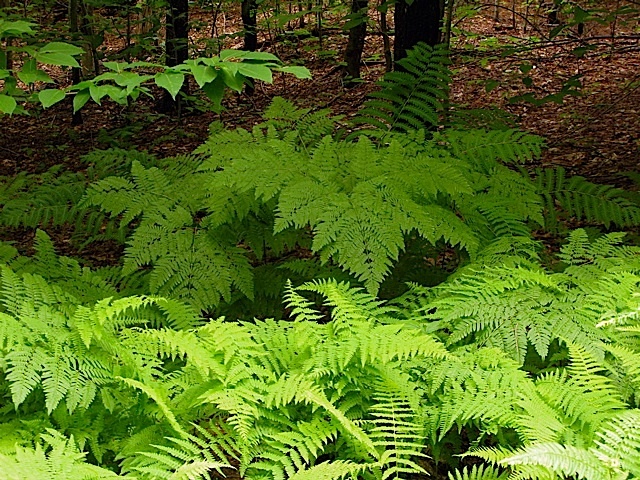 By midsummer, the foliage of the cinnamon fern deepens to a regal emerald hue. Later, in autumn, the bold foliage turns a brilliant gold that absolutely glows in the forest. As lovely as it is in a natural setting, the cinnamon fern is also a spectacular addition to the garden. This non-aggressive plant forms thick but contained clumps of growth. 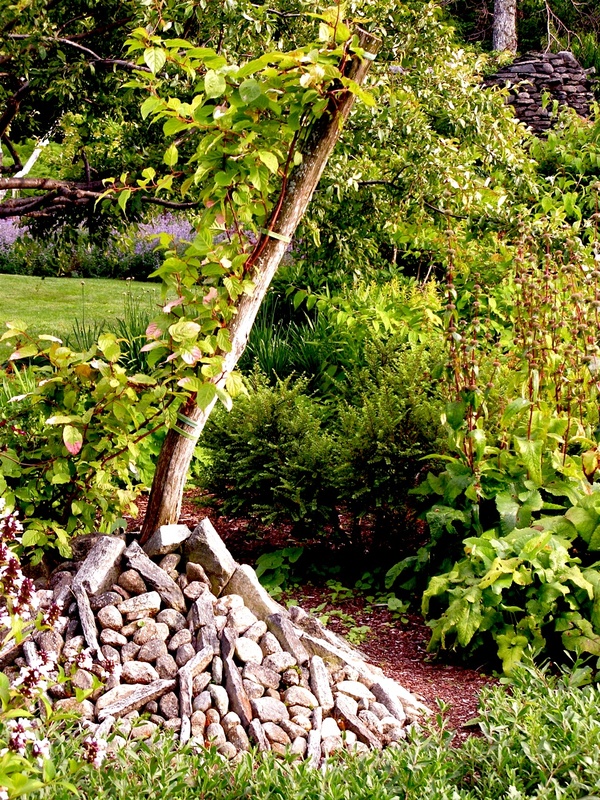 As a companion to spring flowering bulbs, and a contrast to the exfoliating bark of trees, (river birch, stewartia and paperbark maple spring to mind), the design possibilities of both the lush foliage and cinnamon-colored stalks make the cinnamon fern one of my favorites. Cinnamon fern’s close relative, the interrupted fern, (Osmunda claytonia), is another gorgeous native plant. 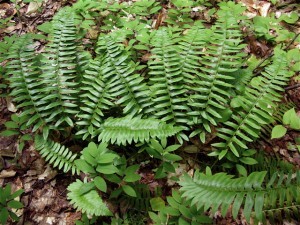 As the fiddle-heads unfurl to a height of 2-3 feet, the foliage on this fern’s upright, fertile fronds is interrupted midway by sporing pinnae. This break gives the plant its common name, ‘interrupted’ fern. 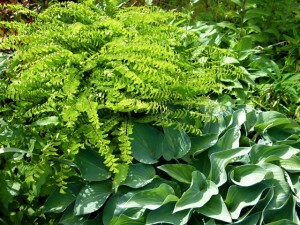 The non-sporing fronds arch away from the plant dramatically, creating an attractive, flowing green mound. 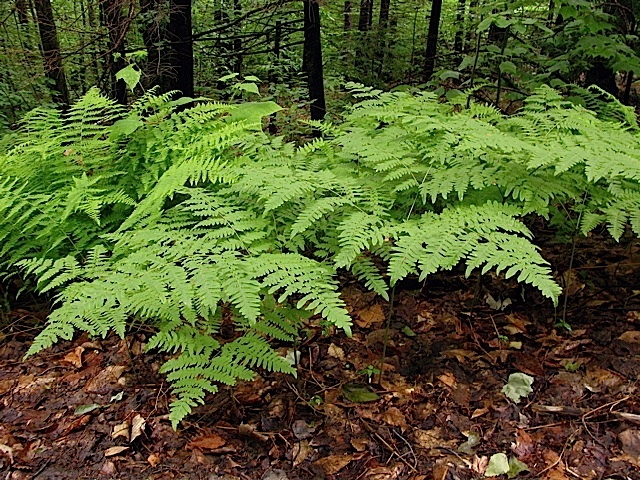 Interrupted ferns prefer slightly damp conditions, where they forms natural groupings in the wild. 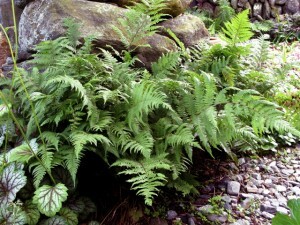 As a garden plant, the interrupted fern is endlessly useful in dappled light and partly sunny conditions. 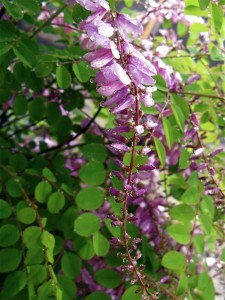 Though large, the airy fronds of this fern combine well with many trees, shrubs and perennials. The Christmas fern, (Polystichum acrostichoides), is an evergreen fern, and one of the most shade tolerant members of this species. Another North American native, this leathery-leafed plant can often be found carpeting steep banks in densely forested areas. As a garden plant, the soil-stabilizing qualities of Christmas fern make it an excellent choice for shady slopes and other places where erosion is a concern. In Northern woodlands, the beauty of this plant’s glossy, deep green foliage is well appreciated in late autumn and early winter, when most deciduous trees have shed their leaves and the forest floor has turned brown. It is easy to understand how the enormous, feathery plumes of Ostrich fern, (Matteuccia pensylvanica, pictured below), earned their name. This gorgeous fern is also one of my favorites, and placed with care, it can be a fantastic garden plant. 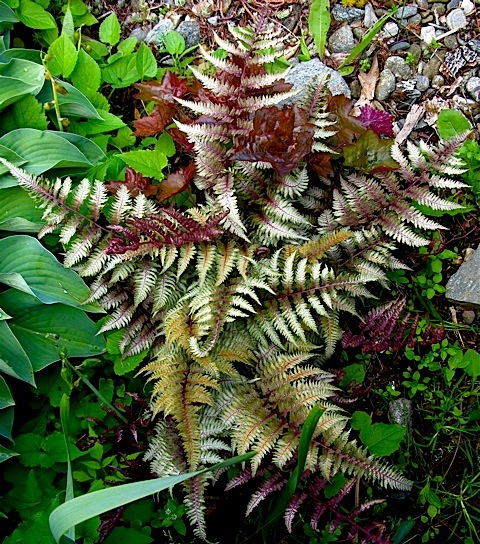 Ostrich fern spreads by aggressive rhizomes, making it useful as a ground cover in damp areas. If planted in a dry spot, (as it is in my secret garden), however, Ostrich fern is mild mannered and easily contained. 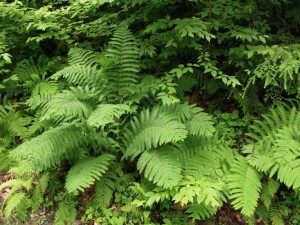 In it’s ideal conditions, (moist, dappled shade), this fern can reach nearly six-feet in height. And although there is no autumn color, if the plant receives ample moisture, it will remain attractive and green through late autumn. Ostrich Fern (Matteuccia pensylvanica) is a member of the cliff fern family. 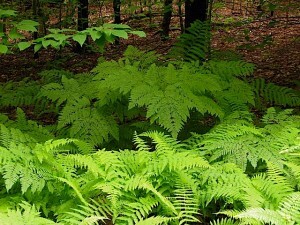 The delicate and airy, native maidenhair fern, (Adiantum pedatum), and lady fern, (Athyrium felix-feminina), are commonly used in gardens, and with good reason. 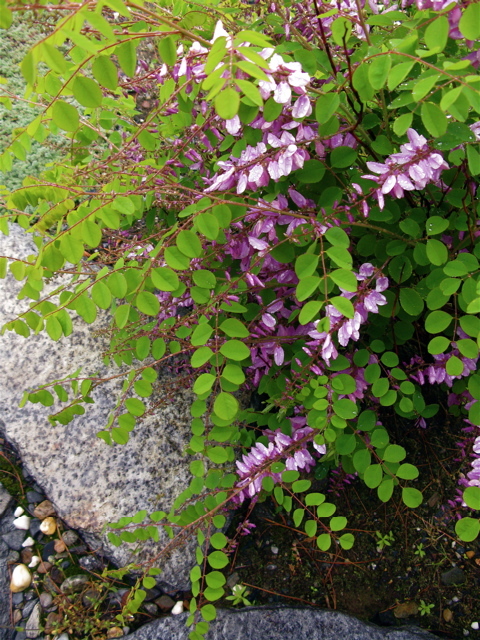 Both of these plants are not only beautiful but tough, tolerating a wide variety of soil conditions and changing light. 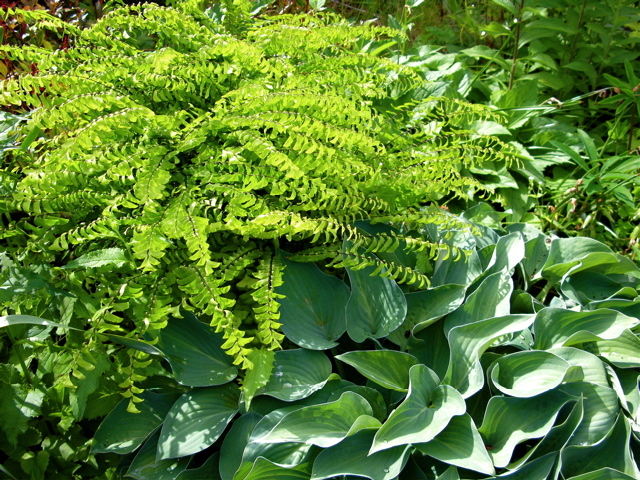 Although both ferns prefer dappled shade and moist soil, they will succeed under less favorable circumstances, and need not be coddled. Lady fern in particular has become popular with commercial growers, and it seems a new variety is available whenever I pick up a magazine or catalogue. Beyond the commonly available lady fern, (a member of my favorite group, the cliff ferns), I have come to enjoy the sanguine stems of Athyrium felix-feminina, “Lady in red”, as they emerge along my garden wall. The northern maidenhair fern (Adiantum pedatum) planted with Hosta. Many of the other ferns native to North America, such as the bracken fern, (Pteridium aquilinum), and hay-scented fern,(Dennstaedtia puctilobula), are lovely in naturalized settings, or singular landscape uses, but are far too aggressive for mixed borders or perennial gardens. Hay-scented fern forms dense carpets, and it is particularly beautiful and useful along woodland paths, hedges, walks and driveways, and beneath dense foliage trees. 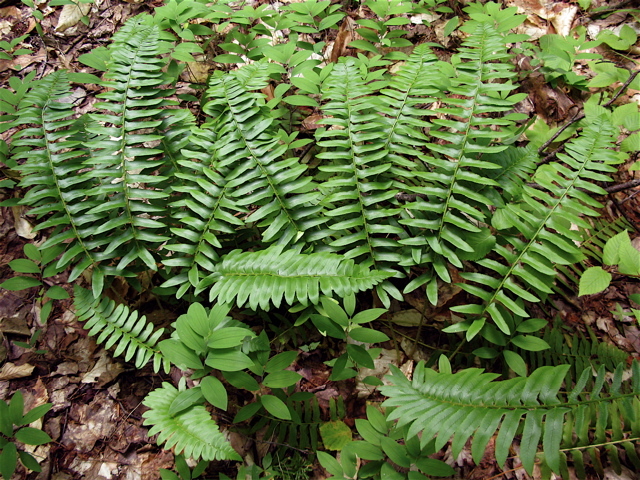 Bracken Fern (Pteridium aquilinum) beautiful in naturalized areas, is an aggressive spreader. 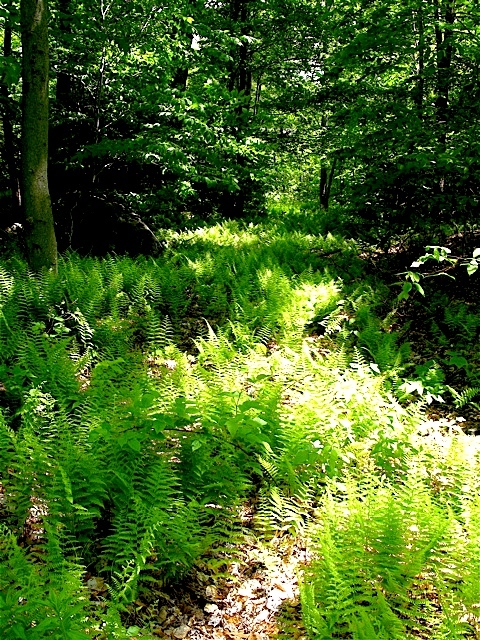 A natural grouping of hay-scented, bracken and interrupted ferns in the forest at Ferncliff. 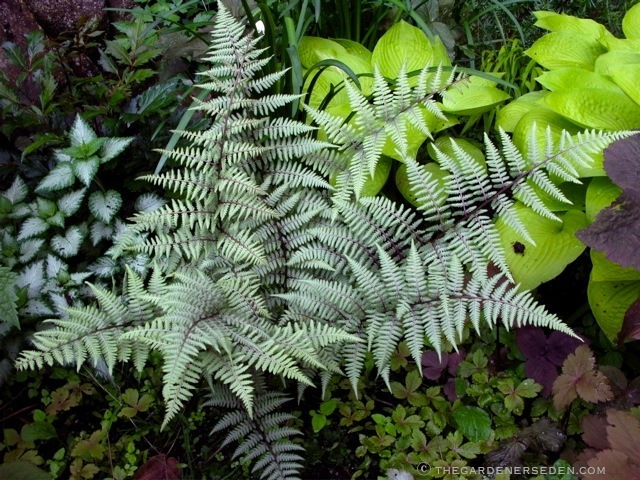 In addition to the many ferns native to North America, introduced garden ferns and hybrids, such as the Japanese painted fern, (Athyrium nipponicum, “Pictum”), are spectacular plants for light to dense shade situations. Beautiful, subtle color variations in fern foliage can be played against one another and in combination with other plants to create breathtakingly beautiful patterns. 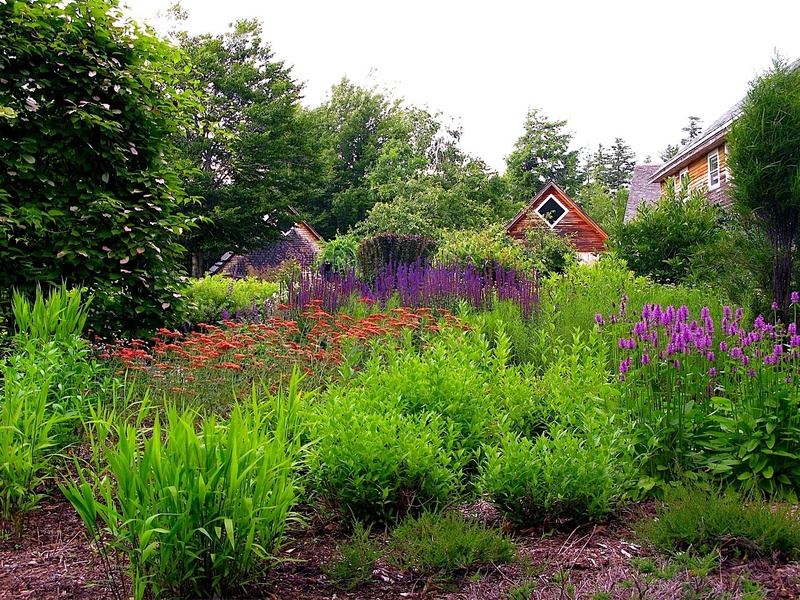 A ground-cover of perennial ferns can become a living tapestry to be enjoyed throughout the growing season, year after year. 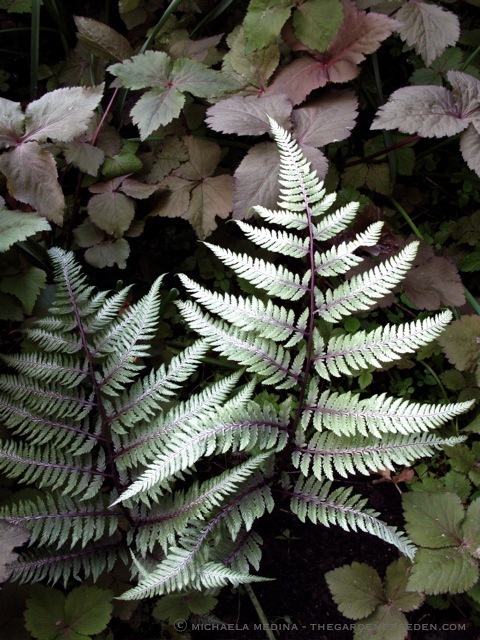 Athyrium x “Ghost” is a particularly beautiful fern, and I have found the color varies a bit by placement and light. The frosty white fronds are stunning at twilight in darker corners of my garden. Having named my garden Ferncliff, it should come as no surprise that I am a true fern-fanatic. 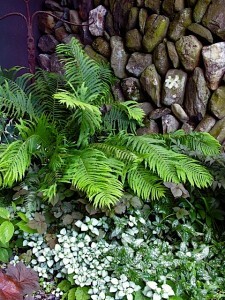 When designing gardens here and elsewhere, I am always on the look-out for new ways to use ferns in garden settings. Ferns are remarkably versatile plants; softening formal designs and lending elegance to modest buildings and simple features. Ferns can be planted in urns to flatter classical architecture, or in geometrically precise planters to harmonize with more modern landscapes. 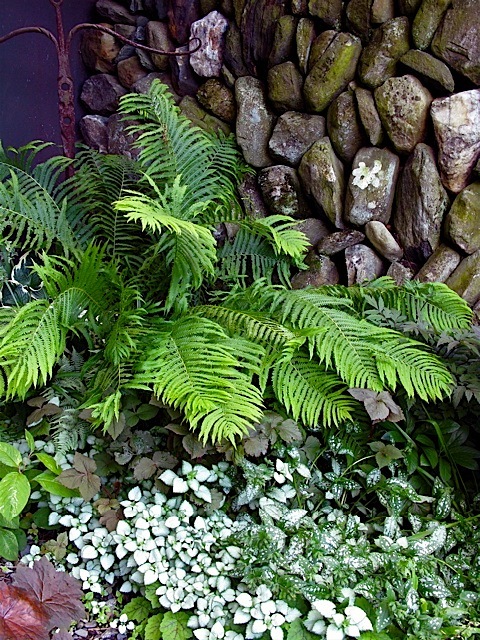 The airy quality of ferns provides movement in shady nooks with the slightest breeze, and the textural qualities of fronds enliven the edge of still or slow-moving water features and smooth wall surfaces. The possibilities of ferns are limited only by imagination. Ostrich Fern, (Matteuccia pensylvanica), softening the edge of the secret garden at Ferncliff. For more information on ferns, see Martin Rickard’s The Plantfinder’s Guide to Garden Ferns, (copyright 2000, Timber Press). June harvest: red chard, arugula, oak leaf and red rumple lettuce..
As I walked back from my kitchen garden on this wet afternoon, colanders and baskets filled to the rim with chard for rissoto and mixed greens for salad, I felt a deep gratitude for all that I have in this life. I can not pretend that this focused awareness is with me all of the time, and I will not paint you some rosy picture of perfection. Still, on this day, after reading news of more uprooted families and lost homes, I am keenly aware of my good fortune in the midst of tough times all around. It is no secret that with the arrival of this economic recession, vegetable gardening has seen a remarkable surge in popularity. People everywhere are looking to save money, simplify and learn new skills. Growing a few basic crops, perhaps some tomatoes and lettuce in raised beds, has become a popular place to start. From the neighbors down the street to First Lady Michelle Obama, it seems that just about everyone has planted a backyard potager this year. And now that June has arrived, hopefully all of that hard work, planting, weeding, and battle with mother-nature, has produced something edible in those little vegetable plots. 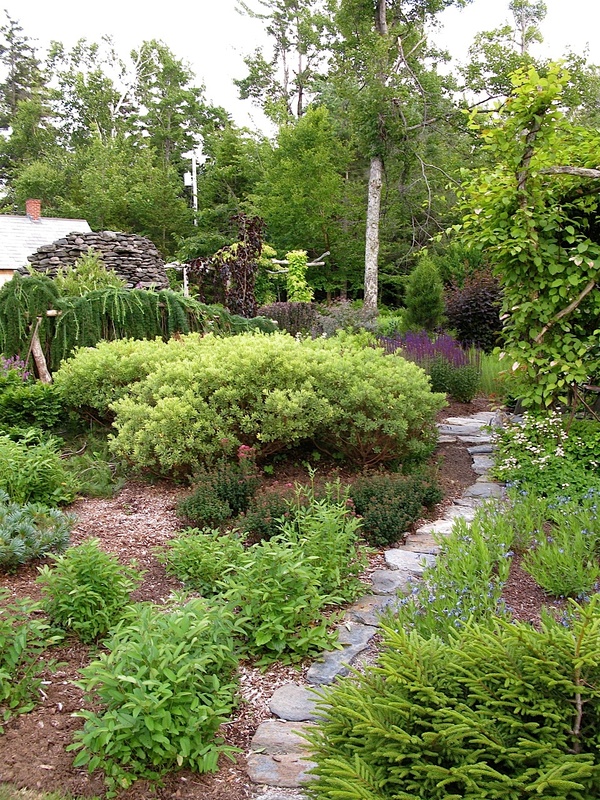 It comes as no surprise to most green-thumbs that with this fresh, new crop of gardeners comes a renewed interest in home cooking. The direct link from hand to mouth is a natural one for gardeners, and for many of us, consuming organic produce can be as simple as washing and tossing a salad of new greens or steaming a bowl of broccoli on the stove. Somehow though, I have a hunch that all the bright colors, fresh fragrances and delightful tastes in the garden are stirring more creative culinary urges. Like most vegetable gardeners, I am interested in learning the secrets of kitchen-alchemy that will turn my organic produce into gourmet gold. But in all honesty, Giada De Laurentiis I am not. With a busy schedule and competing demands of work, home and garden, lately I find myself searching the internet for simple summer recipes and inspiration. Food sites have become incredibly popular on the web; so much so in fact, that New York Times writer Mark Bittman recently ran a post in his column, Bitten, requesting recommendations from readers on favorite culinary blogs. In my own experience, late night web-log-surfing has resulted in some delicious discoveries for both mind and palate. My new-found love affair with food blogs began with the Edible Boston website and Facebook page. 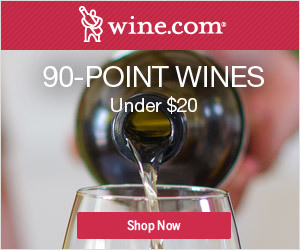 It was there that I discovered a link to one of my favorite new food blogs, Poor Girl Gourmet. Poor Girl Gourmet is written by Amy McCoy, a talented photographer, culinary-whiz and soon-to-be-published author of a new cookbook from Andrews McMeel. The recipes on Poor Girl Gourmet are imaginative, but easy to follow. And best of all, in these challenging economic times, Amy McCoy is indeed frugal-minded. Yet for me, there is more. Beyond the great recipes, what truly separates Amy’s blog from the virtual sea of online cooking journals is quite simply her engaging, entertaining style of writing. Poor Girl Gourmet is witty, conversational and fun. 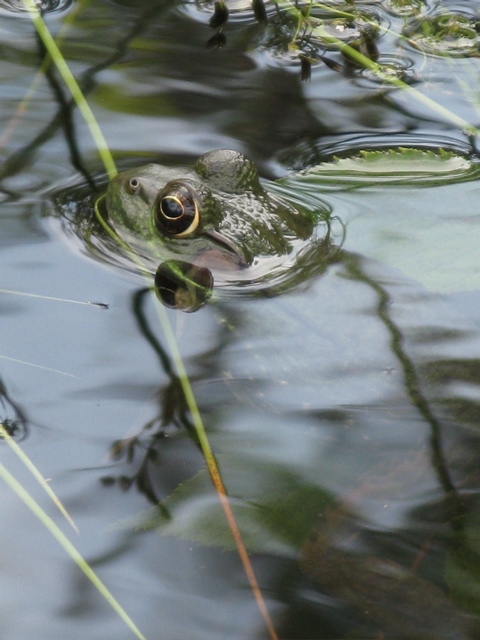 As a gardener, I caught myself laughing-out-loud while reading methods of squash-bug control in her recent post “Memories of Zucchini Blossoms Past“. Recipes on the site are always served up with a perfect side dish of short stories and personal anecdotes. From the beginning, the combination was enough to stir my appetite and imagination, and to keep me coming back for more. 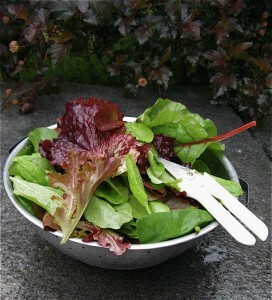 I am eager to try all of the new recipes on Poor Girl Gourmet as the gardening season marches on. In meantime, I can now personally recommend her delicious French Breakfast Radish Bruschetta, and also the delightful Toast with Sour Cream and Jam, (with fresh thyme from your garden, of course). While visiting Poor Girl Gourmet, I happily discovered some other internet gems; among them, the incomparable Orangette. Although the author, Molly Wizenberg, is currently taking a break from her blog-writing, the site and accompanying archive are worth visiting for the evocative photography and addictive journal entries alone. The posts on Orangette are exquisitely written; as poetically rendered as any novel I have ever read. But there is so much more to this gorgeous blog, and I haven’t even touched on the recipes yet ! For a quick look at what Orangette has to offer, click on over to her recipe index. Vegetable gardeners, (like most of you, dear readers), will love the quality, variety and ease of the author’s selected recipes. Her site will help you make use of your tender greens, sun ripened tomatoes and just about anything else you harvest from your potager. Molly has also published a book, “A Homemade Life: Stories and Recipes from My Kitchen Table“, and you can bet it is already on my wish-list. Equally compelling, the writing style of Tea and Cookies is at once mysterious and personal. With a cup of Earl Grey and a warm blanket, cozying up with Tea’s journal feels like an intimate tete-a-tete. I can imagine sharing evening hours in my garden room with the author, swapping stories and homemade delicacies. This blog is simply delicious. There are so many new sites I have yet to explore on rainy weekend afternoons. But another spot I must mention here, Sassy Radish, is also becoming a personal favorite. This snappy web log is written by the lovely and talented Olga Massov, a Russian immigrant with a flair for “all things pickled, herring, pelmeni, cabbage and sour cream”. Like the other blogs recommended here, what makes this one a stand-out is the combination of great, easy-to-follow recipes and distinct, personal style. Olga’s entries are charmingly conversational. Within a few posts I felt like a new friend; a virtual guest in her tiny on-line kitchen, listening to her sweet stories while watching her prepare exotic, European-inspired dishes. The memory of her latest post,”Pasta with Stinging Nettles and Ramps Pesto”, stopped me in my tracks yesterday afternoon as I was about to string trim a weedy patch at the edge of my meadow. “Why waste those nettles”, I thought, newly educated, “when they can clearly become a great meal”? On each of the sites mentioned above, (as well as on the fabulous 101 Cookbooks, and Cheap, Healthy, Good, or the myriad others popping up on my blogroll under the cooking section), you will find lists of more like- minded cooking blogs. Search these fantastic sites for ways to creatively use the fruits of your kitchen-garden labor. Along the way you may encounter the names of a few new vegetables, herbs or fruits you might like to try-out in next year’s potager. For now, I will leave you with an early summer favorite from my own recipe box. Although it will take a bit more sun, (please! ), before I can harvest my beloved sungold cherry tomatoes and basil from the garden, I certainly have a bumper crop of arugula on hand! Hopefully the weather here in the Northeast will improve, as I am eager to taste the sweet and spicy flavors in this quick no-cook recipe I copied with minor adaptations from Martha Rose Shulman‘s original on the New York Times website last year. Bon Appetite ! You are currently viewing the archives for July, 2009 at The Gardener's Eden.